For Henry, business tycoon, secret agent, Casanova and acting President of the United States, life was rarely dull. For his wife, Alice, life was rarely anything but dull. Enter Michel, a French waiter, tall dark and available! Fantasy blurs into reality and secret passions explode in this two hander where both actors quickly change into and out of a variety of outrageous characters. 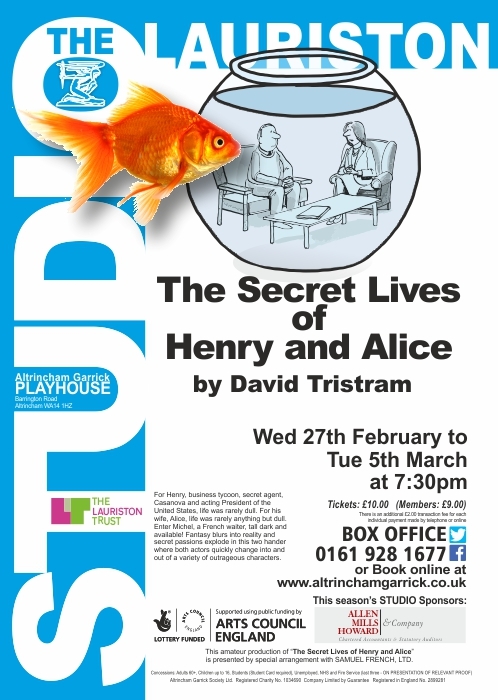 This amateur production of "The Secret Lives of Henry and Alice" is presented by special arrangement with SAMUEL FRENCH LTD.